The ilium (/ˈɪlɪəm/) is the uppermost and largest region of the coxal bone, and appears in most vertebrates including mammals and birds, but not bony fish. All reptiles have an ilium except snakes, although some snake species have a tiny bone which is considered to be an ilium. The name comes from the Latin (ile, ilis), meaning "groin" or "flank." 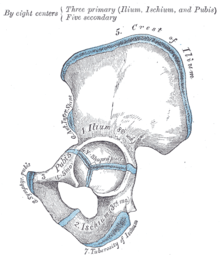 The ilium of the human is divisible into two parts, the body and the ala; the separation is indicated on the top surface by a curved line, the arcuate line, and on the external surface by the margin of the acetabulum. The body enters into the formation of the acetabulum, of which it forms rather less than two-fifths. 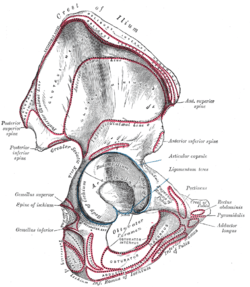 Its external surface is partly articular, partly non-articular; the articular segment forms part of the lunate surface of the acetabulum, the non-articular portion contributes to the acetabular fossa. 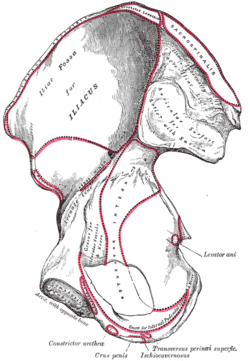 Below, it is continuous with the pelvic surfaces of the ischium and pubis, with only a faint line indicating the place of union. 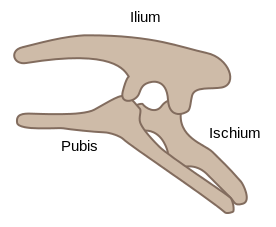 The body of ilium together with the wing forms the ilium. 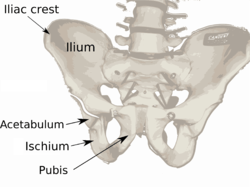 The wing of ilium (or ala) is the large expanded portion which bounds the greater pelvis laterally. It presents for examination two surfaces—an external and an internal—a crest, and two borders—an anterior and a posterior. The clade Dinosauria is divided into the Saurischia and Ornithischia based on hip structure, including importantly that of the ilium. In both Saurischians and Ornithischians, the ilium extends laterally to both sides from the axis of the body. 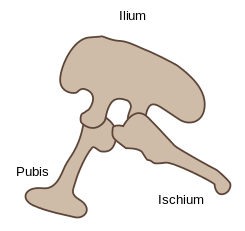 The other two hip bones, the ischium and the pubis, extend ventrally down from the ilium towards the belly of the animal. 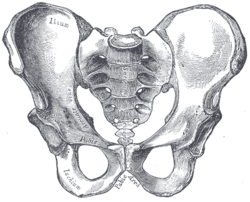 The acetabulum, which can be thought of as a "hip-socket", is an opening on each side of the pelvic girdle formed where the ischium, ilium, and pubis all meet, and into which the head of the femur inserts. The orientation and position of the acetabulum is one of the main morphological traits that caused dinosaurs to walk in an upright posture with their legs directly underneath their bodies. 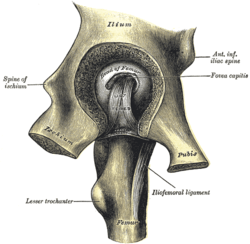 The brevis fossa is a deep groove in the underside of the postacetabular process, the rear part of the ilium. The brevis shelf is the bony ridge at the inner side of the fossa, the bone wall forming the internal face of the rear part of the ilium, which functions as an attachment area for a tail muscle, the musculus caudofemoralis brevis. 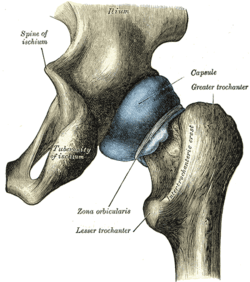 Often, close to the hip-socket the lower edge of the outer face of the postacetabular process is positioned higher than the edge of the brevis shelf, exposing the latter in side view. Some dinosaurs did not have lliums such as the widely known pteradactal. The biiliac width measure is helpful in obstetrics because a pelvis that is significantly too small or too large can have obstetrical complications. For example, a large baby or a small pelvis often lead to death unless a caesarean section is performed. The first editions of the official Latin nomenclature, Nomina Anatomica of the first 80 years (first in 1895) used the Vesalian expression os ilium. In the subsequent editions from 1983 and 1989 the expression os ilium was altered to os ilii. This latter expression supposes a genitive singular of the alternate noun ilium instead of a genitive plural of the noun ile. Quite inconsistently, in the 1983 edition of the Nomina Anatomica the genitive plural of ile (instead of ilium) is still being used in such expressions as vena circumflexa ilium superficialis. In the current 1998 edition of the Nomina Anatomica, rebaptized as Terminologia Anatomica the expression os ilium is reintroduced and os ilii deleted. ↑ Jacobson, Elliott R. (2007). Infectious Diseases and Pathology of Reptiles. CRC Press. p. 7. ISBN 0-8493-2321-5. ISBN 9780849323218. Retrieved 2009-01-09. ↑ Taber, Clarence Wilbur; Venes, Donald (2005). Taber's cyclopedic medical dictionary. Philadelphia: F.A. Davis. ISBN 0-8036-1207-9. ↑ Martin, A.J. (2006). Introduction to the Study of Dinosaurs. Second Edition. Oxford, Blackwell Publishing. pg. 299-300. ISBN 1-4051-3413-5. ↑ "Encyclopedia of Medicine: Cesarean Section". eNotes. ↑ Ruff C, Niskanenb M, Junnob J, Jamisonc P (2005). "Body mass prediction from stature and bi-iliac breadth in two high latitude populations, with application to earlier higher latitude humans" (PDF). Journal of Human Evolution. 48 (4): 381–392. doi:10.1016/j.jhevol.2004.11.009. PMID 15788184. Retrieved 2006-07-26. 1 2 3 4 Hyrtl, J. (1880). Onomatologia Anatomica. Geschichte und Kritik der anatomischen Sprache der Gegenwart. Wien: Wilhelm Braumüller. K.K. Hof- und Universitätsbuchhändler. 1 2 3 4 5 6 7 8 9 10 Lewis, C.T. & Short, C. (1879). A Latin dictionary founded on Andrews' edition of Freund's Latin dictionary. Oxford: Clarendon Press. ↑ Schleifer, S.K. (Ed.) (2011). Corpus humanum, The human body, Le corps humain, Der menschliche Körper, Il corpo umano, El cuerpo humano, Ciało człowieka, Människokroppen, Menneskekroppen, Τό ανθρώπινο σῶμα, ЧЕЛОВЕК. FKG. ↑ Dorland, W.A.N. & Miller, E.C.L. (1948). The American illustrated medical dictionary.’’ (21st edition). Philadelphia/London: W.B. Saunders Company. 1 2 Klein, E. (1971). A comprehensive etymological dictionary of the English language. Dealing with the origin of words and their sense development thus illustration the history of civilization and culture. Amsterdam: Elsevier Science B.V.